This little bird is stunningly beautiful. I love the sharp contrast between the its dark mask and chin patch, and its white breast. The females are similar in color to the males but have paler masks and throats. They are not very common, and their numbers are declining. Chrysoptera will interbreed with Blue-winged Warblers and this has resulted in hybrids known as "Lawrence's" and "Brewster's" warblers. Along with this, nest parasitism by cowbirds, and loss of suitable habitat has also contributed to the swift decline in numbers. 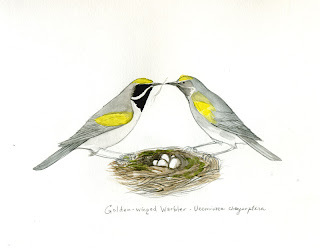 It does not nest in the Chicago area, as it is only a migrant in these parts. Oh these two are so so sweet!